ISLAMABAD, Pakistan (CNN) -- The Supreme Court of Pakistan on Friday declared that the 2007 emergency decree imposed on the country by former President Pervez Musharraf was unconstitutional, Pakistan's attorney general said. 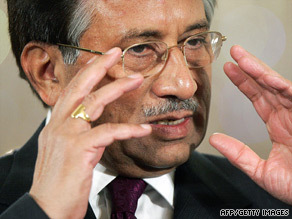 Pakistan's Supreme Court says former President Pervez Musharraf's moves were illegal. Sardar Muhammad Latif Khan Khosa said the court also ruled illegal all judicial appointments by Musharraf, who dismissed about 60 judges when he declared the state of emergency. The fired judges included 14 of the 18 on the Supreme Court, including Chief Justice Iftikhar Chaudhry. Ali Ahmed Kurd, who is president of the Supreme Court Bar Association, called the ruling a success, and urged that Musharraf be brought to trial. Under Pakistan's constitution, only the federal government, of which Khosa is a part, can prosecute someone who has violated the constitution. Asked whether this would happen, Khosa said, "We will look into it later." Musharraf declared a state of emergency on November 3, 2007, suspending the nation's constitution. Chaudhry declared the action illegal, but shortly afterward Musharraf had him expelled from office. Other judges and thousands of protesting attorneys were either arrested or detained in their homes. Critics said Musharraf sacked the judge because he was preparing to nullify his election in October to a third term in office. Under increasing protests and threat of impeachment, Musharraf resigned in August 2008. According to the high court's latest ruling, the removal of Chaudhry violated Article 209 of the Constitution and another rule of law passed by the court. "Hence, in view of the facts and reasons stated above, Justice Iftikhar Muhammad Chaudhry is still the Chief Justice of Pakistan as per Constitution, and all appointments and reappointments made in the Supreme Court and High Courts without consultation of de jure chief justice of Pakistan are unlawful, illegal" and went beyond the Constitution. Farahnaz Ispahani, a spokeswoman for President Asif Ali Zardari, issued a statement saying: "This landmark decision is the victory of democracy." "By terming [the] November 3 action unconstitutional and illegal, the Supreme Court has created history and has blocked future attempts of any adventurer to take any such steps that are devoid of constitutional path. "This decision is the last nail in the coffin of dictatorship and would be written with the golden words in our history," she said. Musharraf's dismissal of Chaudhry in November 2007 was the second time that year that Musharraf had taken that action. After the first dismissal, in March, Chaudhry was placed under house arrest -- outraging many Pakistanis. Fourteen superior and civil court judges and two deputy attorney generals resigned over the matter, and thousands of attorneys marched to Islamabad demanding that he be reinstated. Protests later turned violent. In July, the Supreme Court ruled the dismissal of Chaudhry had been illegal and reinstated him.